Design Sanctuary Ltd was approached by Stewart Barnes, MD of QuoLux to help him, and his team, produce a high-value publication. The purpose? To bring together the thoughts, stories and self-discoveries of the owner-managers, directors and respective teams involved in the QuoLux leadership development programmes. Those who are open-minded enough to explore new perspectives, and open-hearted enough to share their own experiences. It had to be leading in quality, tone and feel. Meaningful. Relevant. Ground-breaking. A journal that delivers visual impact at every turn of every page. And so, Leading was conceived and its award-winning, cross-organisation team assembled. 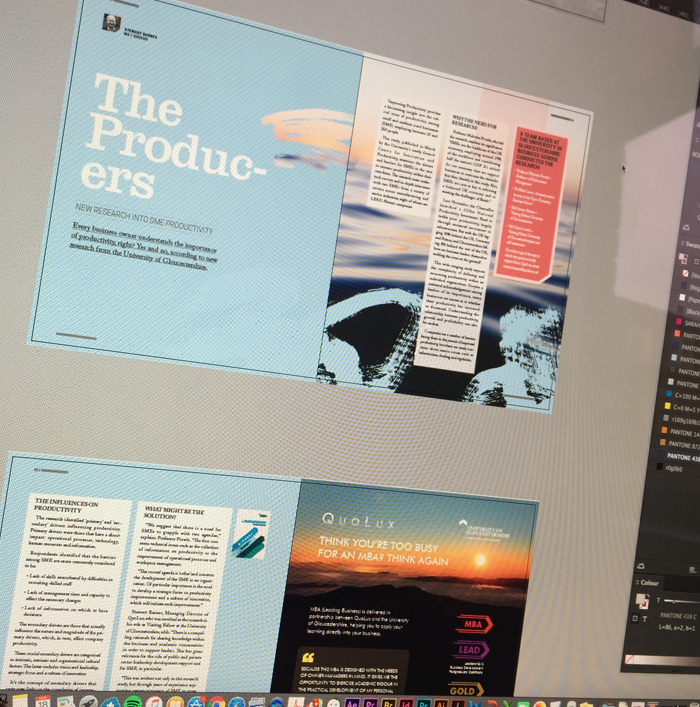 Issue 01 - The Productivity Issue. Why is the UK’s productivity so sluggish? With high employment levels, but low productivity, are we all just wasting our time? The debut issue of Leading explores new research and personal views on this crucial topic.